When I first started with Shaklee I immediately started on all their supplements, Shaklee180, and cleaning products and didn’t even try the skin care line because I was using up some stuff I had. As I have started using more and more of the skin care line I have been so impressed. My chronically dry skin during the winter has gone away, and my skin has never felt so soft (just ask to feel it :)). All my customers that use the Enfuselle Skin care line LOVE IT and always have people commenting on what they use for their skin! 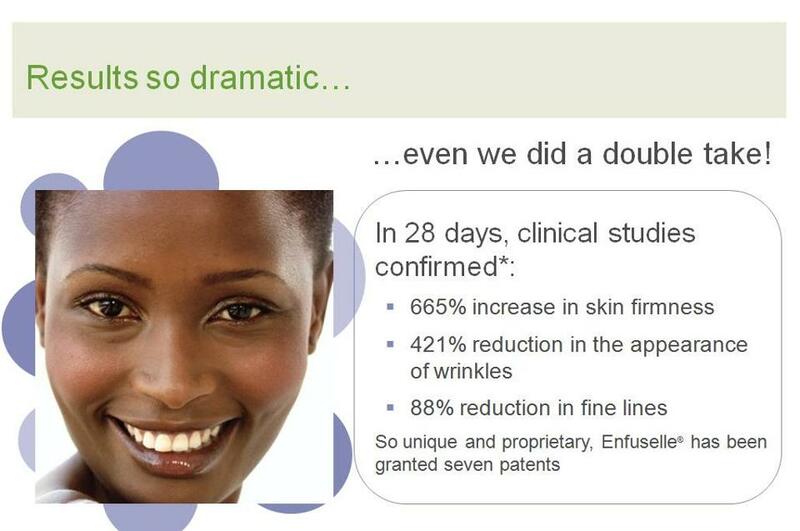 A few years ago Shaklee hired one of the top cosmetic chemists in the country and then assembled a team of their top nutritional scientists to work with him and the result was a line of 16 new products so unique that they carry 7 patents. Many skin care lines don’t even have 1 patent, let alone 7!! I love using the skin caring knowing that they are…. Nutrient Based- It turns out that the same nutrients that help keep you healthy on the inside also play a huge role in how you look on the outside. So it should come as no surprise that the answer to amazing skin comes not from cosmetic company, but from the foremost natural nutrition company. Clinically Proven- Shaklee spent over a million dollars to find the right nutrients and the right amounts and it paid off! See results below. Hypoallergenic- See testimonies below on what people have to say with sensitive skin! I love this apple test and the results it showed. 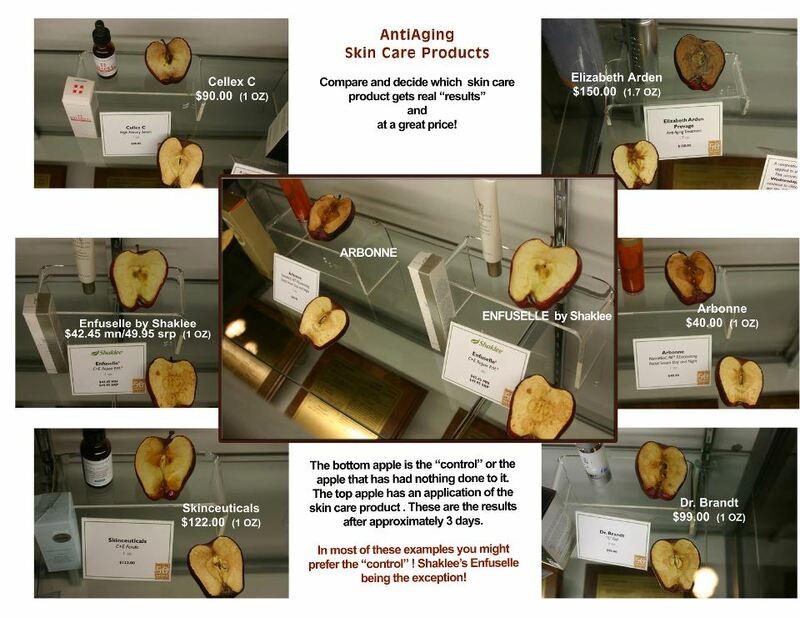 The top apple was treated with the skin care product labeled, the bottom was the control. This apple experiment demonstrates the effect of oxidation in humans (from free radicals in cells/tissues in bodies contributing to aging). Once apples are exposed to air they begin to oxidize. 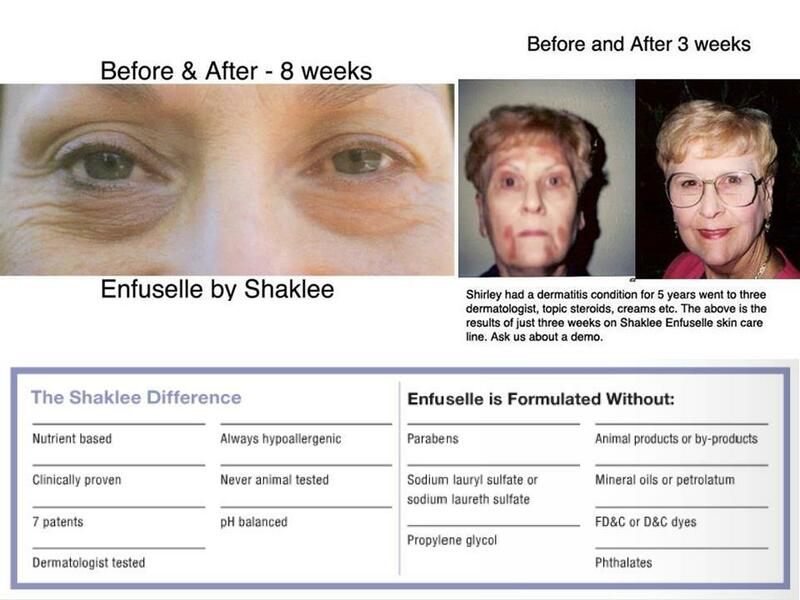 You can see that Shaklee’s apple that was treated with Enfuselle actually looks better than the control. 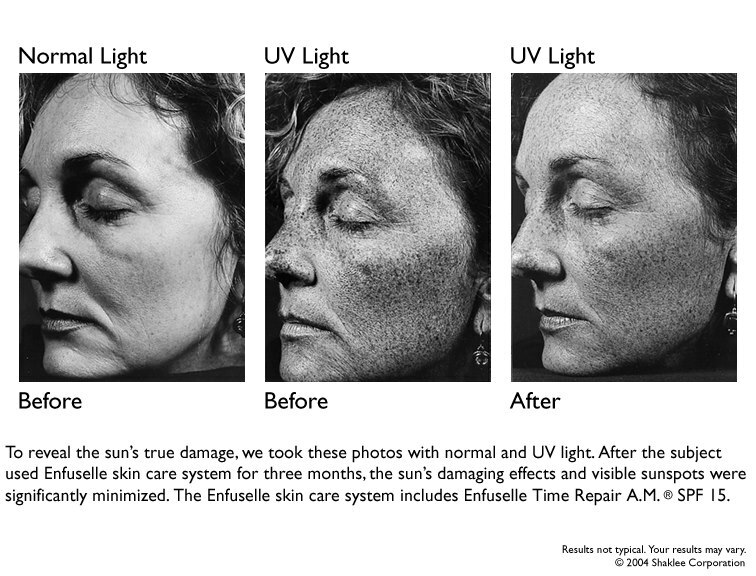 All the other skin care lines are worse, demonstrating no product on the market comes close to performing like Enfuselle! We all know applying lemon juice to apples prevents browning, the same holds true for skin care products that contain vitamin C.
I have tried everything out there. Cannot use any of them, Avon, Marykay, Arbonne, all the store ones. I break out. I was using Neutrigena when I started Shaklee. It didn’t do anything for my skin but I didn’t break out. Moyra talked to me about our skin care. I said no, I didn’t want to risk breaking out again. Then she said what do you have to lose? It’s money backed guaranteed. So I tried it, and will not change to anything else! I even had the Marykay gal ask what I found because my skin looked great (and I have 50+ skin!). My daughter now uses it and my son does too. Helps with his breakouts. I use the Shaklee acne cream after toner and before moisturizer. I love how it really sinks into the skin as opposed to just sitting on top! This makes it easy to layer moisturizer and makeup on top without it caking.I also have extremely sensitive skin and love the Shaklee eye cream – it doesn’t burn my eyes like some other eye creams have!I also noticed a huge improvement in my breakouts when I went mostly vegan. Eliminating dairy seemed to help my skin breakout less. I am 49 years old next month and in my entire life I have never been able to use anyones facial products for any length of time due to sensitivity issues that, if not immediately apparent, will show up in 1-3 days. Enfuselle is the first time in my LIFE that I can use every single product with no irritations. My sister (almost 7 years younger) was just commenting on how I look like I had a face lift. I use the acne clarifying complex because it is the first acne cream I have ever been able to use. My husband, Lowell, finally got rid of his Cystic Acne once and for all with Shaklee–when even accutane for 6 months failed to stop it. Topical things like enfuselle acne treatment are fine to dry up places–but the real healing comes from within. Send me an email if you want more info on the party. If you live out of town, I have some skin care samples I can mail you! Just let me know! this web site, this blog is in fact amazing. Thanks for visiting Our Tiny Nest! My name is Katie and I’m a 20-something wife and Mama Bird to a sweet little chicky. I work as a health and wellness coach dedicated to helping people live healthier lives. I hope to also share my love of family, celebrating events with unique touches, tasty treats, and more on here. I firmly believe that all good gift comes from the Lord! I hope you are encouraged by some of these gifts I share on the blog! Enjoy!